The new look Wii is coming to Europe, and comes with Wii Sports and Wii Party but no GameCube support. It's now come to light that Nintendo isn't expected to drastically reduce the console's trade price, but that retailers may still drop the machine to as low as £79.99 in the run-up to Christmas. A Nintendo spokesperson confirmed to MCV that the trade price will be similar to previous Wii bundles, meaning the standard price could be in the £129.99 range. However, to spur demand some retailers are prepared to cut the price to less than £80 in the all-important fourth quarter, an absolute bargain all things considered. This is likely to be Wii's final Christmas of any relevance: is a sub-£80 price tag enough to help the console maintain a positive and profitable holiday presence? Wow! I already own a Wii, but that is a great price. I bet it'll boost the sales! WOW! That's a low price! Good price, but it's pretty obvious a last ditch effort to trick people into buying the system at Christmas before it's replaced next year. Still, if you don't have one yet, it's well worth the price now, even if you were only going to play Mario Galaxy and Smash Brothers on the thing. I don't get it... I don't have a Wii, but why would I want one that does less? Oh well, I can easily wait till the Wii U is launched. The Wii looks much better with the Wii logo horizontal. It a fantastic price considering what the individual items cost without the console. Wiimote Plus £30,Nuchuck £10,Wii Sports £20,Wii Party £25. Its a fantastic price for anyone that doesnt already own one. Although surely there can't be that many people who dont. I already have my Current Wii sat on its side like the one on the box, have done since it launched so to me at least it doesnt seem like much of a re-design. The only differance is the lack of gamecube support but again that isnt an issue for me as I dont even use my current Wii for Gamecube games. Gamecube was dead and burried a long time ago in my opinion. Well, from looking around I was able to find Black Wii bundles (with Wii Sports, Wii Sports Resort and a Motion Plus attachment for the controller) for £99 already so it needs to go even lower than that. Christmas 2009 I bought a Wii for my family, had it been £80:00 then they would have got a few more presents. It's a good price for anyone to buy a second Wii or some one who hasn't got one yet, Overall it's a good price considering a wii-mote costs about £35:00 and the nunchuck is around £15:00, Wii-Sports 'Select' is also around £15:00 the console and the leads with Wii-Party is pretty much free. I wonder how much profit Nintendo will make from it? So, how much does it equate to in American dollars? @Sir_Dragoon: Doing a straight conversion gives about $130. (Google is your friend). 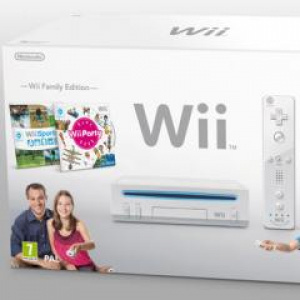 That price and the coming titles could make the Wii a top-selling christmas gift. Kirby, Just Dance 3, Skyward Sword, Nintendo Selects, Rayman Origins, Go Vacation, Mario Party 9, The Last Story and Pandora’s Tower could bring in some people that don't own a Wii yet. That around $130, not too shabby. Besides the Wii really needs to be around $100 as even the PS3 now is $250 here in the US, which we all know you get a lot more with the PS3 when compared to the Wii. @motang: But the PS3 doesn't include a game and that's a great value on every Wii SKU. At this time, with the Wii's near coming death and Wii U coming in a year and with the fact that they're taking off half of what the Wii is, this price is actually reasonable. Anything higher than that is a waste. 80 Euros is about 116 American Dollars if the exchange rate site I found is correct? It sounds like a good deal for our European friends. I'm not sure why Nintendo is considering something like this in America but perhaps its not necessary. I'll stick with my old Wii, thank you. I'd have to sell my GCN games if I bought this Wii, and I love them all very much! They just want people to but it before it is replaced. did the same with dsi xl before 3DS, and no gamecube?! Why is Nintendo pushing the fazing out of old systems, between this and the strange no GBA on dsi? Do you remember the extra RAM memory you could put into your DS that came in the form of a gba cartridge (opera had it included) ? Well they made it standard in DSi, thats why there is no GBA support! I think that Nintendo doesn't lover the price in America because it is a much wealthier land. Sure Europe is rich too, but many (Eastern) European countries are poor and also there might also much individual "export" from Europe to nearby Africa... might be that these are the reasons for a European "budget"-model. But maybe this is all nonsense and America will also get this "new" Wii after Nintendo has simply "tested" the money-making-effect on the European guinea-pigs a.k.a. consumers. Before Christmas there is, in some countries, also Sinterklaas. So in Holland at least there are two times children receive gifts in December! Sinterklaas is on 5th December and Christmas - as everyone knows - is on 25th & 26th of December. So it is not too early for Nintendo to start gearing up for the gift-season. Why are people acting like this (lower price) doesn't happen with every console that's ever existed towards the end of its life span? I guess there has to be such a drastic price cut to compete with the massive second hand market for Wii stuff. I was going to sell £1000+RRP of Wii stuff 6 months ago when cash was short, and would have struggled to get more than £150-£200 for the lot, so I kept it which is a decision I do not regret, I'm a serial hoarder who hate's selling stuff! 100€ Wii+game vs 250€ PS3+game, I guess Nintendo will be still confident that most people target only the cheapest device (considering that PS3 hardware has the real value of around nine Wiis). Hope we will se a gold version/bundel of this wii model when skyward sword is coming out. Is it only the white Wii that is getting "redesigned"? I have only seen the white one, but they should have at least black ones too. My mom is thinking about getting the family a Wii and Wii Fit for Christmas, so, if this came stateside, this would be really cool to get.